Simple example program for the PIC12F675 microcontroller | ad hocumentation • n. fast, instinctive documentation of ideas and solutions. The PIC12F675 is a very inexpensive 8-bit microcontroller from Microchip that’s available in an 8-pin DIP package (i.e. it’s suitable for breadboard use). I’ve had a small tube of these on the shelf for a few years, but I’ve only just got around to trying one out. 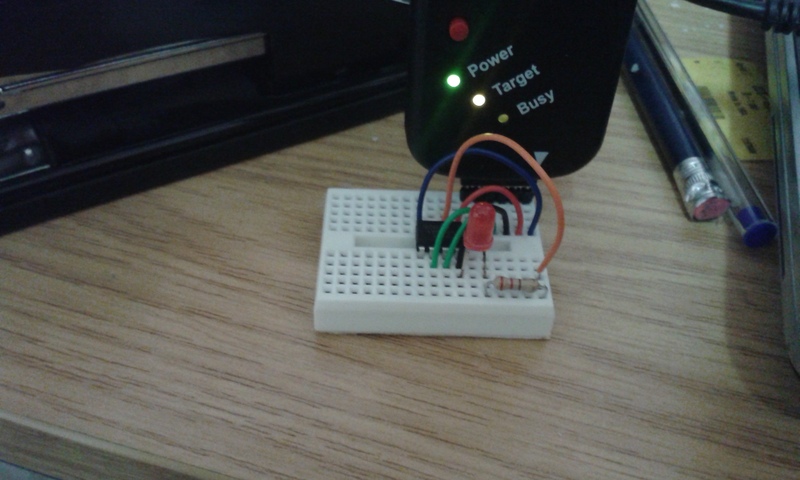 In this post, I present a simple example circuit and program, which flashes an LED on one of the GPIO pins. 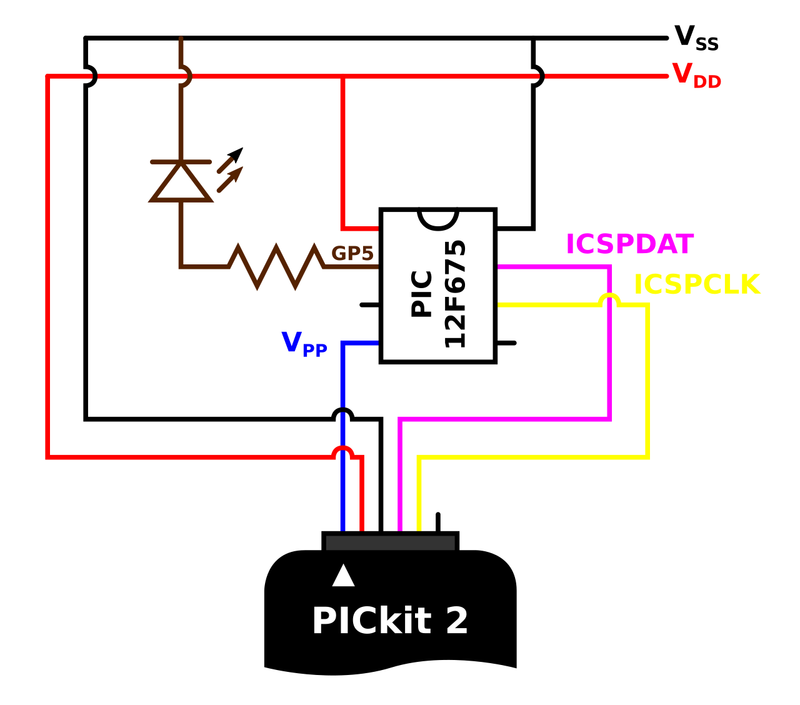 The example circuit includes connections to the PICkit2 USB programmer that I’m using to program the device. The PICkit2 also supplies power to the circuit. First, here’s the video of the example program running on the PIC12F675. This is the full C code for the flashing LED example. I built it using Microchip’s XC8 compiler (the compiler command line is shown in the opening comments). Click here to download editable Inkscape SVG file of circuit diagram. This entry was posted in Uncategorized and tagged 12F675, blink, breadboard, C, example, flashing LED, Microchip, PIC, PIC12F, PIC12F675, simple, XC8. Bookmark the permalink. …no leds are blinking anymore. Why would that be?? Short answer: I don’t know. Seems strange that GP1 is working in the first case but not in the second! Possible reason: Do you have anything else connected to GP0 other than the LED? Is the USB programmer still connected to the PIC? If so, pin 6 is used as ICSPCLK. I would assume ICSPCLK is a digital output on the PICkit2 (or whatever programmer you’re using) which would be a problem if you start using pin 6 as a digital output too (i.e. GP0) because if they disagree about the logic level you effectively have a short circuit. That’s just off the top of my head. Sorry for the delay getting back to you. I can’t find the time to keep up with all the comments!